Eating healthy in Nigeria is not much of a big deal, but if you actually give it a second thought, it is. A lot of content we read in Nigeria about dieting, or eating healthy, or losing weight are often not written to curb those problems the Nigerian way. Like i was reading about “How To Reduce Belly Fat” one day, and the writer kept on putting stuff, or foods that are kind of hard to get in our environment. So i thought i should probably help out by writing this. PS: not that this content is better than others, its just that i tried to only include ways of solving these issues that are easily seen or found around us. If water were a food, it would be a super-food. It helps digestion, promotes clear skin, acts as an appetite suppressant, and even prevents heart disease, among many other benefits. Some research has even shown that drinking water can speed up metabolism and help you lose weight. Although the whole drink-eight-glasses-a-day advice is now thought to be a myth, it doesn’t hurt, and it’s better than drinking energy drinks or flavored waters that may contain lots of sweeteners. You can also drink fruit juices if you like, but make sure they are actually “fruit juices” and not all those water and colourings they call juice nowadays….lool. Yes i would say their is no food anywhere in this world that would do you as much as salads, well of course their are different types if you like to experiment. You can switch from the traditional vegetable salad that we all know to fruit salads, to bean salad, meat salad and so on. This is pretty simple to understand, its simple, do not over eat. Sometimes it’s hard to tell when you’ve crossed the line from nourishing yourself to overeating. That’s because it takes up to 15 minutes for your brain to receive signals from your digestive system that you’re full. Eating slowly can help because it gives your brain time to catch up. Also, if you’re unsure, try asking yourself, “Would I eat an apple right now if one was offered to me?” If the answer is no, you’re eating just to eat, not because you’re still hungry. Don’t be afraid to try new food items or menus you have not tried before. Nigeria has quite a wide variety of nourishing and healthy meals you can try…………this one goes out especially to the yoruba peeps, i’m sorry but it’s true. Make sure you eat a vegetable soup at least once or twice weekly. 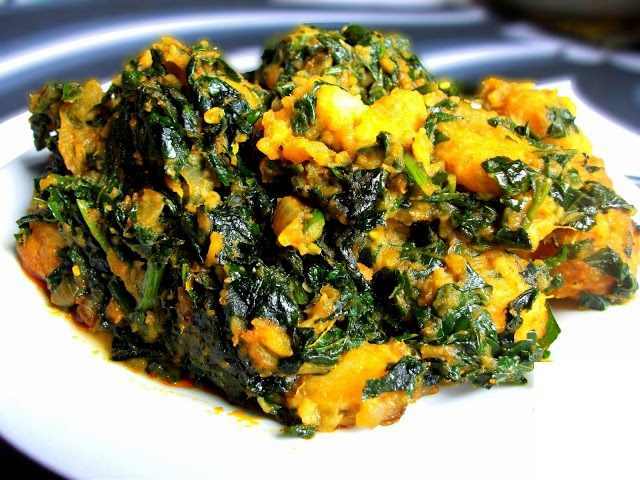 You can try out Edikang Ikong or Egusi, Bitter Leaf Soup and so on. These soups contain large amounts of vegetables, lean meats and whole grains, and so it’s a healthful way to mix up a bland diet. You should try cooking your meals yourself, even if its once in a week. Yes we are in Nigeria and the hustle is tough, and this makes you probably not to have that time in the kitchen, but it is very essential that you have these experiences, as you get to try new things and experiment with food items. Also when you cook yourself, you are sure of the contents and the cleanliness of the meal. And lastly, always make sure your meals contains at least one source of protein. Food items containing protein include Milk, Eggs, Meat, Legumes (e.g. Soybeans) and so on. Proteins are generally good for your health because they are easily digestible, enhances growth of body tissues, and also acts as a fuel source. Proteins are also believed to increase performance in terms of athletics. Amino acids, the building blocks of proteins, are used for building muscle tissue and repairing damaged tissues.